A tackle box? Are you kidding me? Why haven’t I thought of this? Because there are magazines like Better Homes that do the dirty work for me, that’s why! Check this out! If I showed you how I store my batteries, you would feel sorry for me. It takes up an entire pantry shelf and is completely unorganized. Plastic bags, broken boxes and loose sizes rolling all over the place. A tackle box! 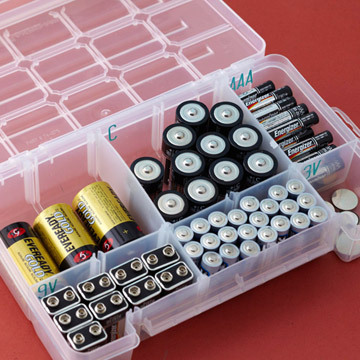 Place all your batteries in a tackle box and organize by size.